﻿Published by Sareth Ney on April 12, 2016 at 4:33 p.m. 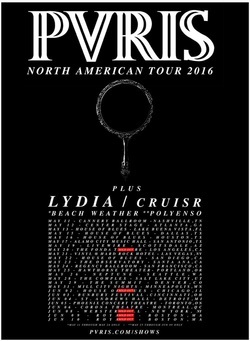 Updated on April 12, 2016 at 7:03 p.m.
LAKE BUENA VISTA, Fla. – PVRIS, CRUISR and Lydia will occupy the House of Blues, on May 13. Their North American tour will begin at Cannery Ballroom in Nashville, Tenn., on May 11. It will come to an end at Royale in Boston, on June 10. Beach Weather will also perform with them for the first half of the tour, from May 11 through May 24. Lynn Gunn is the guitarist and vocalist, Alex Babinski is the guitarist and Brian MacDonald is the bassist of PVRIS. They contribute as keyboardists. Their album, “White Noise”, is available April 22. To visit PVRIS’ official website, please click here. To like them on Facebook, please click here. To follow them on Instagram, please click here. To follow them on Souncloud, please click here. To follow them on Tumblr, please click here. To follow them on Twitter, please click here. To subscribe to their channel on YouTube, please click here. Andy States is the vocalist and guitarist, Jonathan Van Dine is the drummer, Kyle Cook is the bassist and Bruno Catrambone is the guitarist of CRUISR. They are an indie/pop band from Philadelphia. Their EP, “All Over”, is available now. Please click here, to visit CRUISR’s official website. To like them on Facebook, please click here. To follow them on Instagram, please click here. To follow them on Soundcloud, please click here. To follow them on Spotify, please click here. To follow them on Twitter, please click here. To subscribe to their channel on YouTube, please click here. Leighton Antelman is the lead vocalist and guitarist, Matt Keller is the keyboardist, guitarist, bassist and programmer and Justin Comacho is the guitarist of Lydia. They currently have seven studio recordings available. Lydia’s official website can be accessed, by clicking here. To like them on Facebook, please click here. To follow them on Soundcloud, please click here. To follow them on Twitter, please click here. To subscribe to their channel on Youtube, please click here. Nick Santino is the vocalist and guitarist, Reeve Powers is the bassist, Austin Scates is the drummer and Ian Holubiak is the guitarist of Beach Weather. They will promote “What A Drag”. Click here, to follow Beach Weather’s on Bandcamp. To like them on Facebook, please click here. To follow them on Instagram, please click here. To follow them on Soundcloud, please click here. To follow them on Twitter, please click here.